LED string lights are well suited for use as a lighting addition to any decorative project and outdoor signage lighting. One of the most typical uses of light strings is for decoration and display purposes, in particular during Christmas and other holidays, and more specifically for the decoration of Christmas trees. Create a marvelous lighting experience for your home, party or business with these waterproof lights. LED string lights are constructed with a fine bendable copper wire that can adapt to any shape to put in a beautiful decorative accent. These light strings often contain a number of LEDs which emit a solid, unsmoothed point source of light from the LED. A plurality of LEDs are typically illuminated simultaneously so as to obtain certain display colors within holiday decorations. Flexible yet durable, the string lights are great for positioning lights to any decorative project. Wrap them around plants or patio furniture in your garden, or simply around and behind artwork in your home. Decorate your cubicle at work or use it to attract visitors to your restaurant or shop. 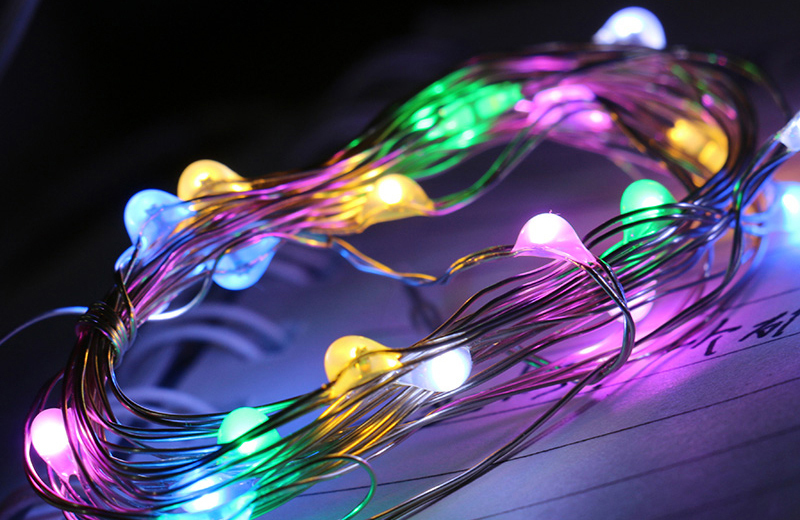 Twinkling or blinking LED light strings are utilized as part of decorative lighting strings. In most blinking light strings, the lights blink on and off in a pattern. A light string that is bright and loaded with flashing patterns will often strongly enhance the holiday spirit of all who see it. Most decorative light strings are series-parallel light strings having multiple groups of series-connected lights interconnected together in parallel. In a series-parallel string, the voltage at each light is the source voltage divided by the number of lights in the series group. A typical flashing string of lights carries a flashing control member formed of IC (integrated circuit) and a plurality of LED bulbs placed electrically in a series circuit. AC (alternating current) is rectified and converted by a full-wave rectifier into DC (direct current) to be consumed by the plurality of blue LED bulbs and the IC. LED string lights can be classified into two types: low voltage string lights and high voltage string lights. The high voltage string lights are powered by an AC power supply or by a power converter (e.g., transformer, AC/DC converter, etc), which is able to provide voltage higher than 5V. The low voltage string lights refer to string lights operated by dry battery, button battery, rechargeable battery, solar cell, etc, which works at a voltage lower than 5V, generally around 3V.